You’ll get more for your work comp dollar with ICW Group. When choosing a workers’ compensation insurance company, you might start by looking for the lowest price. Yet if you go with rock bottom pricing, you’ll most likely get rock bottom service. This can quickly lead to more injuries, less productivity, out-of-control claim costs and a rise in your work comp premiums. Choosing a carrier based solely on price can easily end up costing you a lot more! Make sure you focus on the total value received for your work comp dollar. By doing so, you’ll build a solid work comp program that keeps your workers safe and your costs down. 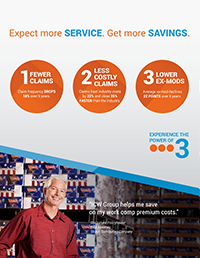 With ICW Group, you’ll partner with a full service carrier that can help you achieve fewer claims, less costly claims and lower ex-mods. We call this the “Power of 3″—and it can help you save on the cost of your premiums.